Over the past few years, there has been a clause added to commercial financing products by small business lenders called a Confession of Judgment. While confession of judgments has been used for decades, if not centuries, dating back to early Pennsylvania law. The use of COJs has especially become prevalent with merchant cash advance and other high-risk business lenders – especially funding companies that stack many cash advance positions. In this article, we will look at what a confession of judgment is, as well as how to get a small business loan without a COJ. A confession of judgment (sometimes called a cognovit note) is an agreement between a funder and borrower that states the borrower accepts liability for the merchant cash advance, and agrees to waive all legal defenses should the borrower meet certain conditions of the funding contract that triggers a default. By utilizing a confession of judgment clause, the funder can get around a lengthy legal process and allows them to recoup funds much quicker by summarily entering a judgment against the borrower. After a borrower or small business owner defaults on the funds, the judgment can be filed in a court without the borrower even being aware, and business and/or personal finances could be seized or have liens placed against them. What makes a confession of judgment different that other sort of legal actions is the fact that the borrower has all but waived their legal rights, and allows the funder to obtain the judgment without presenting evidence to the court, leaving the borrower with no ability to defend themselves or object to the judgment. After the Confession of judgment is filed with the court, the court will then give notice to the borrower that the judgment has been entered, which triggers the next phase which then allows the funder to begin levying business and personal accounts. Why Do Funders Use Confession of Judgments? Most lenders offering commercial financing products have started using confession of judgments more frequently to reduce their risk and increase the probability of being paid-back by the borrower. As long as borrowers know that they could have a levy placed not only on their business assets, but also place a levy on their personal assets, the borrower is much more likely to bend over backwards to make sure the lender if fully-repaid without breaching the contract and triggering an automatic default and eventual judgment. Additionally, by putting in place a confession of judgment, a borrower may avoid getting additional position cash advances and business loans out of fear that over leveraging themselves could put significant stress on the business cash-flow – which could put the borrower at risk of a default. 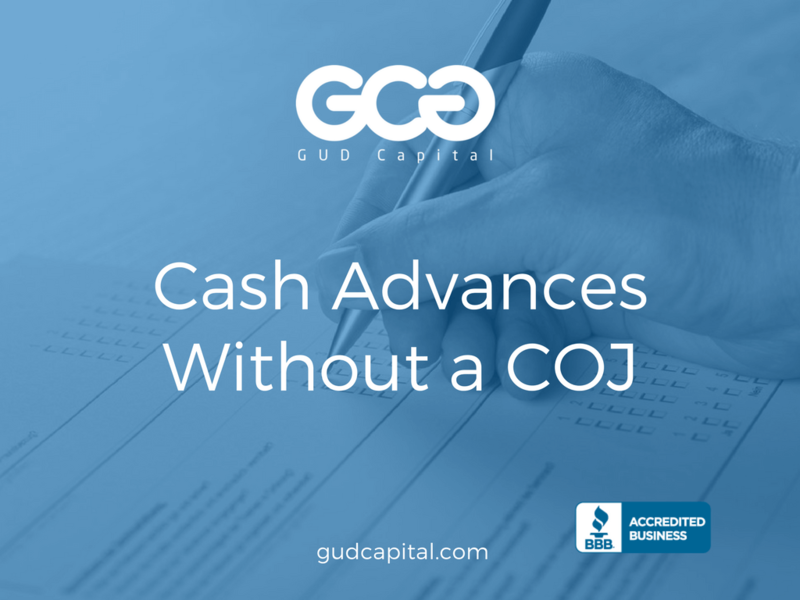 Consequences of Defaulting on a Cash Advance With a COJ? Essentially, if you have a confession of judgment filed against you or your business, you can expect a world of hell. Keep in mind, the main reason a merchant has a confession of judgment filed against them is because of default. Generally, a company defaults because they didn’t have enough money to make payments. So, while your company finds itself unable to meet its financial obligations, it may now have a levy placed against it – which could put the company out-of-business. Types of Financing that Use COJs? Equipment Financing: While not always the case, an equipment leasing company may require the use of a confession of judgement to ensure that not only payment is made on time, but to also ensure that the equipment is returned to the leasing company should the borrower default. So, a confession of judgment serves as a tool to help ensure that an equipment leasing company can recoup its collateral to limit their losses. Merchant Cash Advance Split: a split cash advance is the sale of future receivables to a merchant cash advance company that collects repayment by splitting a percentage of each day’s credit card sales with the small business. Instead of the merchant sending payment to the funding company, the merchant payment processing company automatically sends the agreed upon percentage directly to the funder. MCA split lenders have added protections to prevent against default because, generally, a small business can easily switch payment processors that collect the funds to repay the cash advance lenders. Bank Lenders: Conventional lenders like banks and credit unions generally don’t use confessions of judgments, but do often require collateral (such as commercial real estate and/or personal property) be pledged. Oftentimes a conventional lender will also require a personal guarantee of the loan. SBA Lenders: These types of loans that are backstopped by the United States Government through the Small Business Administration does not require a confession of judgment to get funded. Private Lenders: non-bank private lenders rarely require a confession of judgment and may not require any type of collateral at all – although the loans offered by private lenders aren’t completely unsecured, as they will require pledging business assets and may require a personal guarantee. Commercial Real Estate Lenders: while most commercial real estate lenders (mortgages, bridge loans, asset based lenders) will use the business and/or personal property as collateral for the financing, rather than requiring a confession of judgment.